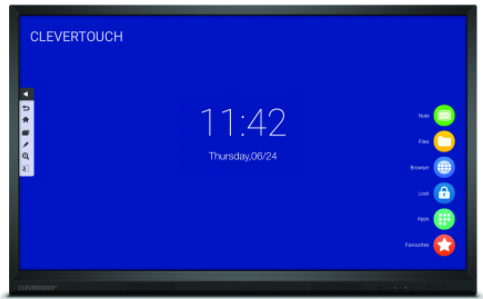 The Clevertouch V Series is the perfect solution for a budget conscious touchscreen. It has all the essential features of a Clevertouch, but without the Cleverstore or integrated apps of the Plus or Pro range. Much of the software and all of the accessories of the Pro and Plus range are available as optional extras for the V Series – check our feature comparison table for full details. Although it’s available in a more compact range of sizes than its big brothers, the V Series should not be taken lightly. The V Series is ideal for use in professional settings such as offices, reception areas, meeting and training rooms, yet robust enough for use in schools, colleges and universities. When paired with an optional slot-in PC there is no end to the features and flexibility available through the V Series. The V Series is also backed by our unbeatable industry leading warranty making it the ideal choice if you’re after excellent value over the full range of software and apps, but still want the reassurance that all of the products in the Clevertouch range provide. Can I use a Blade PC with a V Series? Yes, a Blade PC can be used with a V Series.